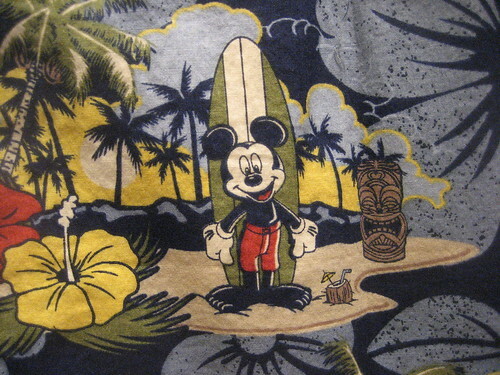 Mickey Mouse & Tiki Aloha Shirt – Elias & Co.
What’s better than Disneyland? Disneyland with no crowds (well, fewer crowds, anyway). We were lucky enough to experience that at the passholder preview for Cars Land and Buena Vista Street, which officially open at California Adventure on June 15. This thoroughfare pays tribute to the 1920s, when a young Walt Disney arrived in Los Angeles to start a new animation studio (and the rest, as they say, is history). 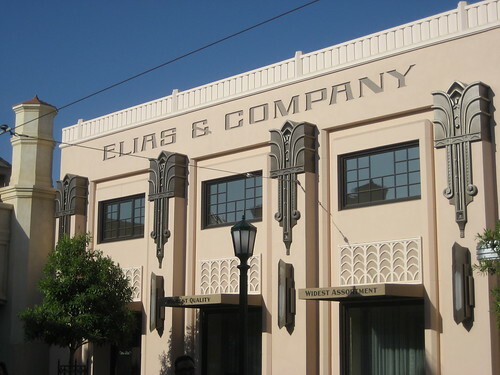 It was such a treat to stroll around and admire the ersatz Art Deco architecture, especially the Elias & Company gift shop. The inside is made to look like a luxury department store (see: Bullocks Wilshire), and one of the rooms displays vintage sheet music on the wall as props. 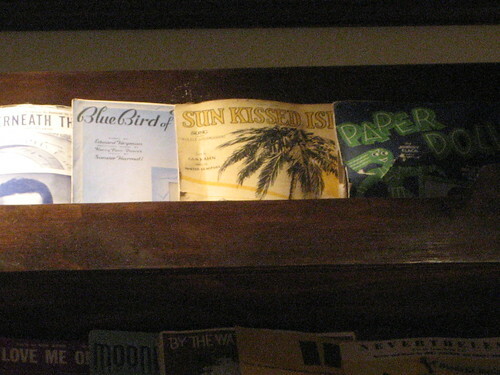 Among them I spotted the tropical cover of “Sun Kissed Isle,” one of many 1920s ukulele tunes inspired by the South Seas. 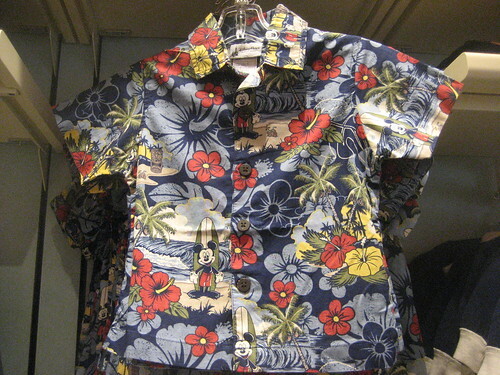 I also found a blue Hawaiian shirt printed with tikis, coconut drinks, palm trees, hibiscus flowers and surfin’ Mickeys. Disney seems to have produced quite a few aloha shirts with tikis over the years, not even counting the ones Shag has designed. 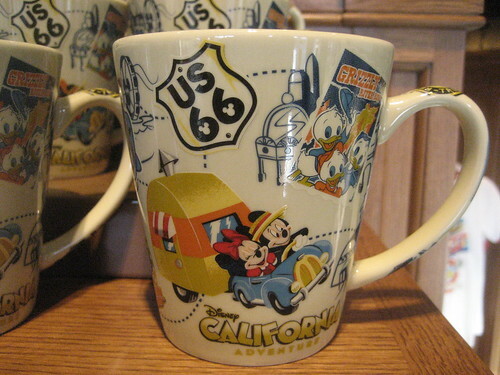 They stock some neat mugs (coffee, not tiki mugs…you’ll have to go to Trader Sam’s for those) like this one that reminded me of the awesome travel trailers we saw at Palm Springs Modernism Week. This is just the tip of the iceberg of the new merchandise being rolled out for California Adventure. 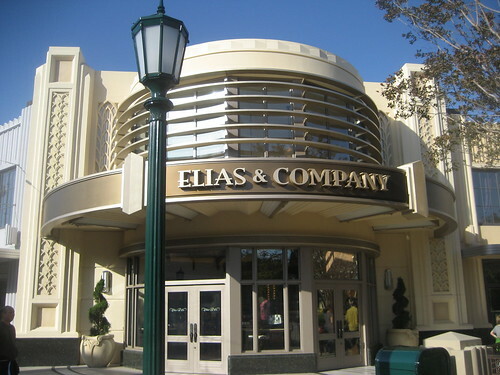 If you want to see more of Buena Vista Street, there are some great photos here and here, plus detailed background about the people and places that inspired it here and here.